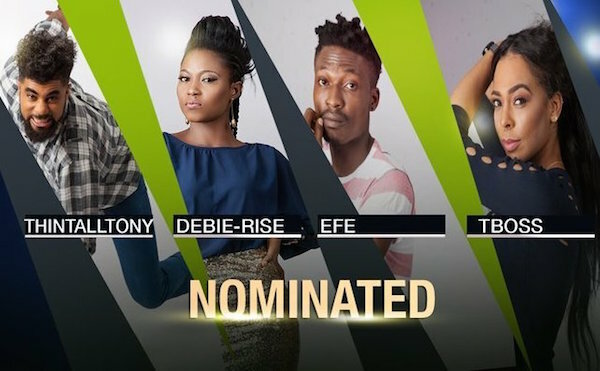 Big Brother Nigeria is getting interesting day after day as four of the remaining eight BBN housemates have been nominated for eviction on Sunday. The housemates are Efe, Tboss, TTT and Debie-rise. Bally, Tboss and TTT got the highest votes for eviction nomination. But Bassey as the Head of House saved Bally and replaced him with Efe. In a twist of events, Marvis used her power card to nominate Debie-Rise. The probability of one of the four four nominated housemates to be evicted on Sunday is 100%.